The SQL SET DATEFORMAT is one of the Set Function, which will set the Order of the date: Month, Year, Day. This Statement supports formats like dmy, mdy, ymd, ydm, and dym where d = Date, m = month, and y = Year. 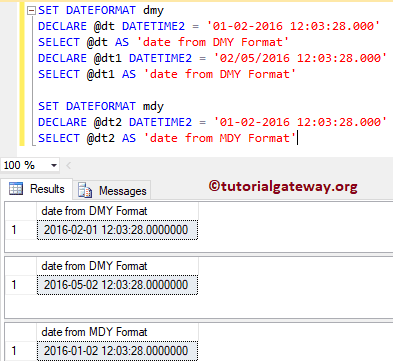 This article will show you, How to use this SET DATEFORMAT in SQL Server with an example. In this example, we will show you, How the SQL Server SET DATEFORMAT will affect the date. Remember, SET LANGUAGE will implicitly change the date format based on the Language you select. But, SET DATEFORMAT will override that format.